The Lake Tahoe area has hiking trails for all levels and ages. Whether you want to take a leisurely stroll around a small lake, or get your teenagers off their iPads and into the fresh air, you'll find various hikes at the lake. So lace up those boots and head into the hills! The Lake Tahoe Basin overflows with hiking trails for all levels. Breathtaking scenery beyond the roadway can be yours with relative ease. Whether you’re in the mood for a leisurely stroll to a small lake, or need to get your teenagers off their iPads and into the fresh air, you'll find easy access to hiking trails everywhere in Lake Tahoe. Some of the best beginner trails listed here are fairly short (less than five miles), and lead to open vistas that are great picnic spots. Depending on you’re energy level, you can also tie into other trails to extend your stroll into an epic day! So lace up those boots, grab some snacks, and head for the hills! If you have small children, they will enjoy the one mile hike from the Carson Pass near South Lake Tahoe up to Frog Lake. 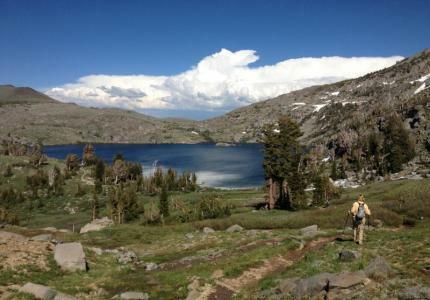 If you have older children, take them another 1.5 miles up to Winnemucca Lake or even farther up to Round Top Lake. Both of these lakes are good for picnics, wildlife and wildflower viewing and even a brisk summer swim. Hot Tip: If your teens or the rest of the family are up for it, a very popular view is to the top of Round Top (over 10,000 feet) for a view of the entire Carson Iceberg Wilderness. Dogs are allowed on leash. Directions: From South Lake Tahoe take Highway 89 to Highway 88 and turn right. Go toward the Carson Pass and park at the Carson Pass ranger station (parking fee required). The trail to all three lakes starts at the top of the pass. This hike is an easy one that is great for families with small children and older folks too. The gentle 2.1 mile loop is well maintained and follows Spooner Lake and provides nice views and several Aspen groves. Nice for fall colors as well. Hot Tip: Hike farther up into the hills to view some snowshoe and XC ski cabins that can be utilized in the winter. Directions: Drive to Spooner Summit on Highway 50, turn north onto Highway 28 near the top. Less than a mile on the right will be the Nevada State Park. The lot has a parking fee. As one of the most popular short hikes in the South Tahoe area, Eagle Falls can be crowded on summer weekends. Start out early in the morning on this trail at the top of Emerald Bay and hike about a quarter of a mile up to the falls. There is a small pool to bathe in at the top of the trail. If you want to continue on into Desolation Wilderness, you will need a day permit (obtained at the trailhead). Hot Tip: You can get a great view of Emerald Bay if you hike up a bit further toward Eagle Lake. The Parking area here fills up fast on weekends too but is a great place to score a spot to access several of the area's best features like Emerald Bay. Directions: From South Lake Tahoe, take Highway 89 toward Emerald Bay. The trailhead for Desolation Wilderness and the falls is on the left hand side as you are heading toward the West Shore. Another good, short hike for kids, this trail on the North Shore starts out as a fire road and then turns into a paved road at the top of the lookout. The lookout area has informational placards about the Tahoe area and views of the entire North Shore. Hot Tip: This trail is a bit difficult to find at first, but ask any local about it. Directions: From Crystal Bay, turn up Reservoir Road near the Tahoe Biltmore Lodge then turn right at the firehouse. Continue up the hill until you reach a point where a steeper U.S. Forest Service road doubles back to the left above you. Follow this for a quarter mile beyond the green metal gate to the parking lot. This is one of the only trails in the mountains that is handicapped accessible. It's a flat, gentle, level trail that is also perfect for very young children. Tahoe Meadows is on the Mount Rose Highway summit, and is only 1.2 miles through granite boulders, pines and streams. There are views of the surrounding peaks and of the lovely Lake Tahoe glittering in the distance. Hot Tip: This trail also has restrooms that are open all year. Directions: From Incline Village, head up Highway 431 up to the Mount Rose Summit. The trail is 1/2 mile southwest of the summit on Hwy 431. There is parking on the side of the road and at one small parking lot, Look for sign for Tahoe Meadows Interpretive Trail. The hike to these alpine lakes near Highway 80 is a little bit of a challenge for children and beginners, but you will reap the rewards at the top of this 8 mile round trip hike with sparkling little clear gems to take in. Or... if you've worked up a good lather, all three lakes at the top of this trail are wonderful for summer swimming. Go ahead, Jump! Hot Tip: Take the entire day to do this hike and bring a lunch. Directions: Take Interstate 80 toward Sacramento and get off on the Big Bend Exit between exit 166 and 168. The parking lot is 1/8 mile east of the Visitor Center and the trail is across the road. This short, but beautiful hike in the Mokelumne Wilderness near the Carson Pass is another hidden gem. The easy 2.5 mile trail will take you through meadows, over creeks and up granite hillsides before dropping you into a small valley where Lake Margaret tempts you with swimming holes and shade. Hot Tip: The end of the trail can be a bit confusing and you may get turned around. Ask any hiker coming back from the lake how to access the last part. Directions: From South Lake Tahoe take Highway 89 to Highway 88 and turn right. Take Highway 88 past Kirkwood and the trailhead will be just past the Kirkwood gas station on the right hand side. This 4 mile hike in the Squaw Valley area is a nice training hike for older children and teens and takes about half a day. The trail takes you through a mountain canyon past waterfalls and granite peaks to the pretty Shirley Lake. This trail may sometimes meander a bit, so remember the general rule is to keep the creek on your left side and follow it down until you arrive at the base of the mountain. Hot Tip: After the lake, hikers can can either hike back up to High Camp and ride the Aerial Tram back down to Squaw Village. Directions: In Squaw Valley, pick up the trail at either the Shirley Lake trailhead or the Solitude trailhead. This easy stroll around Donner Lake near Truckee is great for children and the elderly, and features great views of the lake, the Rainbow Bridge and the mountains. The trail follows a counterclockwise way around the lake and takes you into the pine forests that surround it. Hot Tip: Visit the memorial museum at the trailhead to learn more about the ill-fated Donner Party. Directions: From old downtown Truckee, take the Lincoln Highway (Donner Pass Road) to Donner Lake. The Donner Lake Memorial is on the east side of the lake. This little known 2.2 round trip trail near Zephyr Cove is another easy hike for children and ends at Nevada Beach providing you quick access to some great swimming as well. The Lam Watah trail winds through meadows and over creeks, and has some nice views of the South Shore. Hot Tip: This area can get flooded in the spring making it a good place to view birdlife. Bring waterproof boots! Directions: From South Lake Tahoe, take Highway 50 north toward Zephyr Cove. Turn left onto Kahle Drive. The trailhead starts on the right side of the road.